I was never much of a salad person back home. I don’t ever remember having a salad in or as part of a meal unless it was in the form of some kind of a raita. During my initial years here, I was pretty rigid food-wise, and our meals comprised largely of rice along with curd/yogurt in some form or the other which was due, in part, to the fact that it was my all time favorite meal. Also, I was only just learning (rather unwillingly) to cook and that seemed the simplest thing to prepare. My eating habits have since changed over time, and I am a bit more flexible and open to new tastes now than I was when I first got here. There’s a lot more variety in the meals I make these days. However, curd-rice with pickles (the Indian kind) continues to remain my ultimate comfort food to this day. If I’m making a salad, I prefer going for something that is hearty and filling. I put together this bean salad for dinner the other day, which we had along with some cold soup. Place all the ingredients in a large bowl. Pour the dressing over it. Toss to combine. Chill and serve. This goes to Lisa for the June edition of No Croutons Required. The theme this month is soups or salads featuring legumes. I can really agree with you too. In India I have never ate a salde unless if you call tomtato slices with onions. Me too....Curd rice and mango pickle is my all time comfort food. I can eat it every day. YUM!. Hey this bean salad looks good. Sounds filling too. YUM! We love salads. A healthy salad with protien with greens make it better! Good post. Thanks for this entry! Did you email us? I don't see one from you in the inbox. this is a nice and healthy salad TBC...so simple to make..nice entry. Hey TBC..very delicious and healthy salad..thanks for sharing this. I've taken to making a salad with different kinds of beans and channa and keep calling it three-bean/four-bean salad so that it sounds exotic! I HAVE been wondering about different dressings, though, I usually toss it with lime juice and salt and coriander. Mustard will make a nice change. refreshing bowl of salad! must have tasted yumm with cold soup. In India, salad is a part of the meal, not the meal itself :) But considering todays lifestyle, we should stick to salad, don't you think? TBC, I'm not one for salads either, although I do get stuck with a fair share of them at events where people don't know what else to feed a vegan! your version looks lovely, though, not least because it's not just a mess of greens sitting atop a platter. 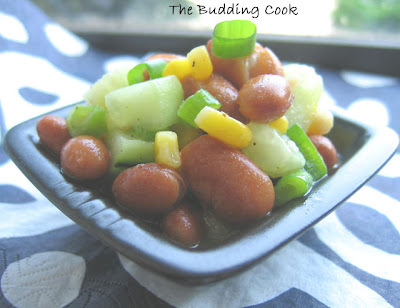 The beans, corn and cucumber sound like a great combination and the dressing is so fresh. Beans and vegetables (fruits, too) make a great salad combination. We probably don't traditionally eat salads because we are cooking up vegetables and beans in so many other ways. I have a surprise for you at my blog,please visit my blog to collect your surprise. This is just the kind of salad I like! Any kind of beans generally go well with veggies! light and airy summer salad, love the pic! I never eat beans without onion and I believe that the bean-scallion combo is great! I agree- adding protein in some form makes it more substantial. Karuna, Ranji, Uma, Trupti, Rachel, SMN and Vanamala- thank you all so much! Srivalli- yeah... that was the case, but it's changing now. Rajitha- I would have the sundal thing when my mom would make the Kerala-style kadala curry. Those kadala beans(I am too lazy to look up the name right now) would be seasoned with the usual stuff and then some coconut would be mixed into it too. It was so good! Aparna- I've tried fruits too, mainly apples and strawberries- they're good too. I would love to have some of this bean salad and cold soup right now! It's been so blistering hot. Your dish is perfect for days like this! A healthy salad with greens make it better. Foodiefriend- You've got to stop using others' pictures on your blog! There are copyright laws against such things, u surely know that!!! I was not a salad person too earlier. Even now, I don't prefer the plain lettuce - tomato salad with dressing. But the bean salad is the only kind I can have. Lovely recipe and picture. Will skip the honey and try it. I too don't make salads! But, I feel that I should regularly make salads during summer! It's so filling and nutritious. Bean Salad looks so tasty! I prefer the ones without greens. Ramya- thank you, that is very kind of you.